For most of the drivers throughout the world, tire blowouts had been one of the worst nightmares forever. No matter how fast or slow you’re driving, a lose on control on a situation of tire blowout can drive you to fatal accidents. If You Have a Blowout While Driving You Should Do What? Many say that experience can be the key to rescue in such situations. But we’re slightly disagreed with them. Due to the advantages of technology, it’s true that accidental car blowouts had been quite rarer than before. But to be honest, this had made the situation a bit more critical. As per such situation have become rare, drivers are less prepared for such incidents. However, the best way to be prepared for a car blowout, and to know what to do if you have a situation. Well, you can take a few technological advantages such as tire pressure monitoring device and so on. But the trump card of the deck is your own preparation. In this article, we’ll be talking about this particular topic. Although there are indicators and other stuff. But nothing is more responsive than your own sense. A bang or boom of the tire popping ad reverberating. A whooshing sound that indicates air slowly escaping through a leak. A flapping or repeated flopping sound that indicated the tire hitting the road. As soon as the tire blows out, your car speed will start slowing down. The movement will pull the car to either the left or the right side of the car. It depends on which tire has been malfunctioned. In case of the front tire blowout, the force will drive on the side of the steering. Apparently, if the blowout is on the rear tire, then you will feel this drag on the seat or the body of the car. 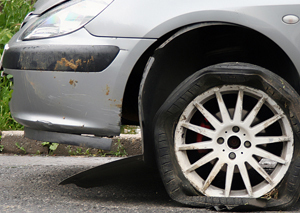 Tire blowouts are one of the reasons for occurring accidents in such cases. But another serious reason is the driver’s nervousness and lose on control of the car. So, the first suggestion I’d give is, don’t panic. Maintain the correct speed of the car, retain full control on the steering and use both of your hands. Don’t make sudden and violent movements. Always be sure about the next step you’re going to take. The second thing to do is to take your car in a safe roadside. Turn the emergency flasher on to warn the other drivers and put the reflective triangles, if your can has one. Let me give you a couple of important advice. While going through the initial step of parking the car, try to keep calm. An excited or tensed hand on the wheel is even more dangerous. Secondly, don’t slam on the brakes to stop the car as fast as you can. Let the car stop on its own. That will prevent any misdirection movement of the car. Get off the car if you are safe and try to look for an immediate help. It’s best if you can help yourself with the spare piece of tire. 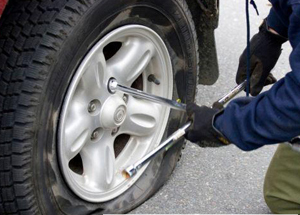 If you are not sure how to change car tire, it’s better to call some roadside assistance. If you have a known car mechanic nearby, that would be good. In case you’re in a long drive and don’t know anyone ready to help, then call for some favor. Be alert on roads on October-November. This is the time of the year when the road surface is the hottest. Eventually, hot roads are more prone to blow car tires. Try to use tires from popular brand like Westlake tires etc. Always keep one or two spare tires on the car for any such situation. Use an electric car pressure indicator. So that, you can always have an eye on what’s going on with the tires. Do a routine inspection of your car’s tires. Look for slow leaks and weak parts of the tires. While you’re on the road, keep the load on the car light. That will prevent uneven pressure on the tires of the vehicle. Be a friend of your car’s manual. It’s always better to do the tire repair yourself rather than waiting for mechanics. Nothing is certain while you’re on the road in a car. 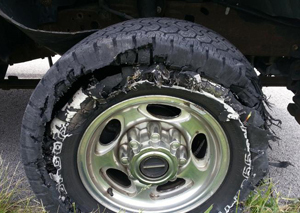 So, does the tire blowout. Therefore, it’s better to stay one step ahead. What I strongly recommend to avoid such situations is to do some routine checks. Checking your tire’s pressure, damage, leaks etc. on a regular basis is a must for drivers. Also, have ample knowledge on what type of tires are capable of the load you’d be carrying on the car.